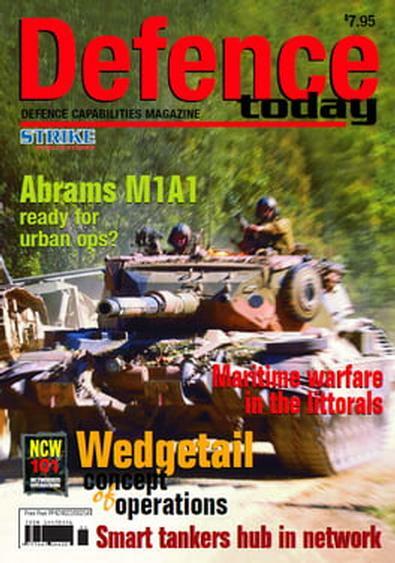 DefenceToday magazine is the preeminent publication in Australia on Defence and Defence Industry capability and homeland security within the region. In-depth articles focus on the platforms, the firepower and the technology that the Defence Capability Plan brings to the Australian Defence Force through multimillion dollar Defence projects – along with the application and warfare effects of these programs. DefenceToday critically examines and forecasts the capability of Australia to defend itself and keep pace with regional developments in air, land and aerospace operations – and Australia’s developing need for Homeland Security and Defence. Be the first person to tell us what you think about Defence Today and you'll save $5 on your next purchase!